Microbes Infect. 2014 Jul 19. pii: S1286-4579(14)00089-6. Listeria monocytogenes is a facultative intracellular pathogen that causes gastroenteritis, meningitis, encephalitis and maternofetal infections. 20–30% of eubacterial ORFs are predicted to encode membrane proteins. The bacterial cytoplasmic membrane is a macromolecular structure, which plays a key role for the pathogenesis. Despite this, little knowledge exists regarding the function of cytoplasmic membrane proteins of Listeria during infection. Here, we investigated a predicted membrane protein of the pathogen L. monocytogenes, Lmo0412, of unknown function. Lmo0412 is only present in the Listeria genus and low conserved in the non-pathogenic species L. innocua. 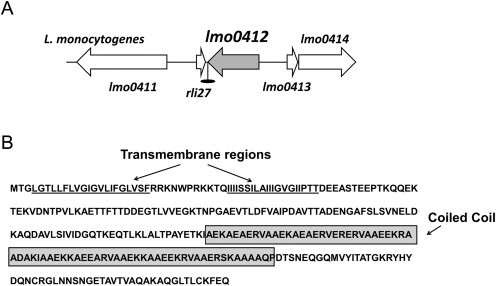 Bacterial fractionation and western blot analyses showed that Lmo0412 was only detectable in the membrane of L. monocytogenes EGDe during logarithmic growth phase. lmo0412 expression in L. monocytogenes was down-regulated during in vitro infection of JEG-3 epithelial cells. An L. monocytogenes mutant deficient in this membrane protein showed increased invasion of Caco-2 and NRK-49F host cells using in vitro infection models. Moreover, the lack of Lmo0412 in this deletion mutant increased the viable bacteria counts in the spleen and liver of mice compared to the wild type strain. Taken together, these data suggest a selective advantage conferred by the absence of Lmo0412 for the virulence of L. monocytogenes.